The item has not been purchased yet (you may still cancel your item). Our purchaser is buying this item now. You cannot delete your item at this point. Our purchaser has paid and bought your item. If a "camera" icon is shown beside the item ID icon, you can click it to have a look. You need to pay more to buy this item. This is usually because your payment is not sufficient enough to cover the domestic delivery fee or item's fee. The items have arrived at our company. Your item is being stored in our warehouse. Please submit delivery as soon as possible before your free storage period of 90 days is over. YOYBUY storage time is 180 days (Arrived + Storing period). If you don't submit delivery during this time, your items will be abandoned and at our disposal. 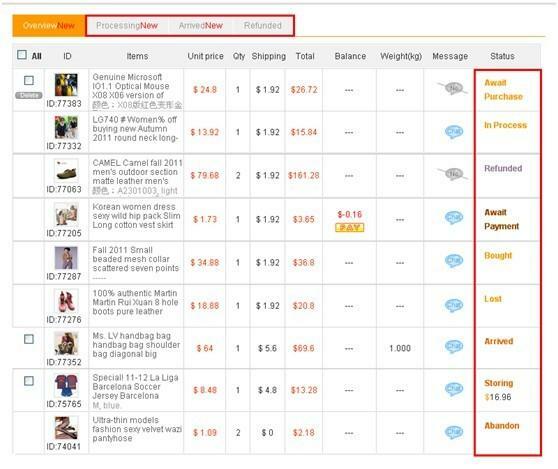 Your items have been lost, but YOYBUY will definitely compensate your loss. You may also directly contact our customer service for help. The money for this item has been refunded back into your account. Note: If your item has encountered problems, our purchaser will leave a message for you. Please click the "chat" icon and reply if there is a "new" alert. Note: When your domestic delivery fee or item's fee is not sufficient, you should click the “pay” button to pay the remaining fees.